Last night we saw a young couple we hadn’t seen for several years. While discussing their desire to start a family, I repeated something I’ve often shared: once you decide to have a baby, you never stop worrying. You worry that you won’t be able to conceive, or that something will happen to the baby. After that are complications of childbirth, childhood injuries, the list goes on. I’ve known many parents who spent more time worrying than experiencing the pleasure of parenthood. Why do we often drown our joy or satisfaction with thoughts of loss or failure? Years ago I shared with my father my excitement about visiting Manhattan again. I had loved living in the city and made great friends who said, “Come and stay with us anytime.” I finally had a chance to visit. “How do you know it’s all right?” my father warned. “What if they’ve changed their mind or moved?” As a young adult who didn’t want her dreams squashed, I felt irritated and resentful. Then it occurred to me that this was how my sweet, kind father lived his life, reluctant to get too excited about anything lest he be disappointed. He once told me how happy he was upon making his high school basketball team. Unfortunately, his father wanted him to work in the family business after school. As my dad proudly showed off his new uniform, his father gruffly said, “take it back.” My father decided at that moment that it was dangerous to become excited about anything. In The Tao of Poo, Winnie the Poo is asked about his favorite moment. “My favorite moment is when I’m opening up a new jar of honey,” he answers. Then he pauses and corrects himself. “No, it’s when I’m thinking about opening up a new jar of honey.” The anticipation of wonderful things ahead is almost as exciting and pleasurable as actually living through them. When we dream of a vacation, recall the delight of being with people who live far away or who have passed away, or imagine what it might be like to do something wild and exciting, we are having an experience. We can see ourselves in those circumstances, we’re reminded of what we love or strengths we have, we see possibilities where they didn’t exist before. If they never actually occur, we still benefit from anticipating them. For others, a sense of unworthiness stands in the way of experiencing joy. Especially true for survivors of tragedies, it can result from any sense of guilt or shame we feel. We feel we don’t deserve to be happy – so we don’t let ourselves feel the joy that’s all around us. Our daughter is visiting this weekend. I know she’ll only be here for a day and that I’ll feel sad when she drives off. I can’t wait to give her a big hug, see that beautiful smile on her face, and watch her joke around with her dad. It makes me smile just to think about it. In this moment I have a choice. Should I feel sad that she lives far away? Or should I choose to focus on the joy of that anticipation and on enjoying her company for the day? 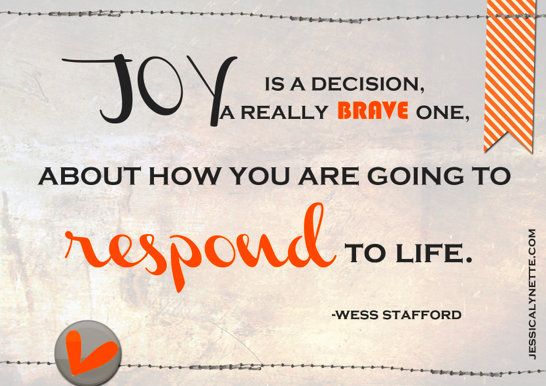 In what ways will you choose joy today? This entry was posted in Doctor Coach, mindfulness, physician burnout, physician coach, physician coaching, physician fulfillment and tagged mindfulness, physician coach, Physician coaching, Physician fulfillment. Bookmark the permalink.